Manchester City are chasing long term Arsenal target Julian Draxler. The 21 year old Schalke player has very publicly been admired by the Gunners and has been subject to some inquiries as well. Especially in last year’s winter transfer window, links between Draxler and Arsenal seemed to be never ending. ai?? ?If you have a look at our style of play, you notice immediately that a player like Julian fits into this technical, creative passing game 100%. He is one of the most promising talents in Germany and will definitely make his way. 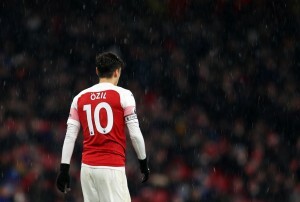 I would like to see his next steps at a club like Arsenal”,Ai? ?the Arsenal defender said. Ai? ?It seems that Draxler might be on his way to England, but it won’t be London where he’ll be landing, it will be Manchester. Seems Manuel Pellegrini is capitalizing on the situation ofAi? ?Matija Nastasic. The young defender is highly rated by the club’s fans, but hasn’t found himself breaking through completely in the senior side. The 21 year year is being chased by numerous clubs including Fiorentina. Roberto deiMatteo admitted that Schalke want to bring the 21 year old to Germany. Di Matteo might have an easier task and the German club’s negotiations can become easier, if they are willing to part with their prized asset. Draxler has struggled with injuries over the past 18 months but is still one of the hottest prospects in European football. He was part of Joachim Lowai??i? ?s 2014 World Cup winning squad. Draxler can operate anywhere in the attack- either on the flanks or behind the striker. However, he mostly plays on the left wing. At 21, he already has 150 appearances for Schalke and would have had more, if he wasn’t regularly in and out of the squad with injuries. He would be a tempting option for any club to have and would add a lot to the Manchester City squad. The Citizens have an older average team than any of the top clubs and Pellegrini would definitely want to add some young starlets so as to find a right balance and ensure they are competing on all fronts in the coming seasons. Schalke would fight them very hard to allow the 21 year old to leave, but the German club would definitely realize that it is a matter of time before Draxler leaves for “greener pastures”. City compete in all competitions, are title runners, so they carry enough luring power with them. Not to mention, it is a rich club and hence, his wages could also be increased considerably. The deal would however depend on Matija NastasicAi? ?as well.Ai? ?It is claimed that City want A?10million to part with theAi? ?defender, but Schalke would prefer to seal a loan move for Nastasic before potentially tying to get him in the summer.